Collecting miniature items is a very popular dream for many collectors. There are many collectors out there who love everything tiny and small. In fact, it is becoming a growing trend all over the world. Instead of collecting big items, which take up too much space, it has become very popular to collect smaller items, and build up entire collections. You only need to watch a television show, go online or look at a Guinness World Records to discover just how big and powerful this movement really is. Collecting miniature ornaments, collectibles, dolls, houses, cottages and even miniature worlds is a big hobby all around the world. Even though the items may be small, they are very detail orientated and take the artists and creators just as long as it would take to design and create bigger items. In some instances, it takes them even longer, due to the precision and detail that needs to go into their miniature items and figurines. You can literally create entire worlds in miniatures and the results can be quite remarkable. If you have ever had the privilege of looking at a miniature collection of items, you will be really surprised at just how detailed and intricate every little thing is. It is really a feast for the human eye as everything is super cute, tiny and precise. Do not think that the cost of smaller items are anywhere less than that of the bigger items. You will be surprised because everything costs quite a lot of money, regardless of the size. There are miniature collections which are made by famous artists and you can get all sorts of miniature designer items which cost extremely high amounts of money. Collecting miniatures is not just a hobby or a pass time for females. 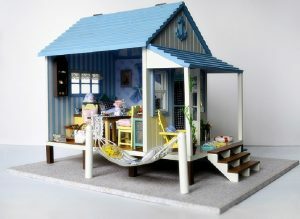 Although females may enjoy collecting miniature houses, dolls, cottages and much more, there are also many items which form the collections of men all over the world.